Yesterday, January 29, 2015 U.S. Navy Ace Commander Alex Vraciu passed away at the age of 96. Vraciu one of the Navy’s top scoring aces, credited with 19 kills during WWII in his Grumman F6F Hellcat. On one occasion he scored 6 kills in one day during the Battle of the Philippine Sea which would later become know as the “Marianas Turkey Shoot”. In late 1944 he was shot down over the Pacific while flying with VF-20 off of the USS Lexington, Vraciu evaded capture and made his way back to American forces. He finally retired from the Navy in 1964 at the rank of Commander. RIP Commander Alex Vraciu. Naval Aviator Alex Vraciu poses next to his Grumman F6F Hellcat with 19 kill flags displayed. 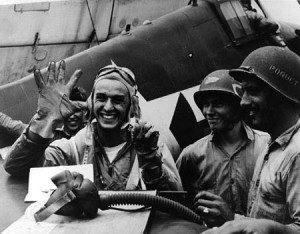 U.S. Navy fighter pilot Alex Vraciu celebrating 6 victories in one day during the Battle of the Philippine Sea. I have waited until now to write something about Mr. Guarnere, who was one of the original ‘Band of Brothers’ of the 101st Airborne Easy Company. I had the opportunity to meet Mr. Guarnere a couple of years ago at WWII Weekend in Reading, Pennsylvania. Mr. Guarnere was a true and kind human being, with a unique sense of humor. Being able to talk to such a man impacted my life by furthering my interest in WWII history. He has touched the lives of many and he will not be forgotten, the legacy that he has left behind will last a lifetime. We recently lost a Second World War hero by the name of Bill Overstreet. He died at the age of 92 years old on December 29, 2013 at the hospital in Roanoke, Virginia. Captain Bill Overstreet was a Us Army Air Corps fighter pilot of the 357th Fighter Group in the Second World War. 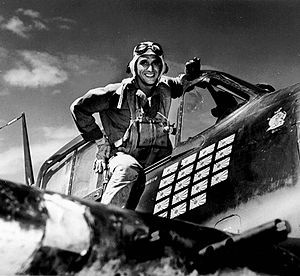 He flew over 100 missions during the war and shot down two confrimed enemy fighters. One the planes he shot down was in a dogfight in which he had chased the enemy plane following it under the Eiffel Tower! Captain Overstreet flew the Bell P-39 Aircobra in training in the United States. During a training flight he was forced to bail out when his plane spun out of control. During the war he flew the North American P-51 Mustang. His first mustang he affectionately named “Southern Bell”, but another pilot who was flying it failed to return from a mission. His next mustang he named “Berlin Express” because, they went to, “Berlin on a regular basis, so I named the rest of my planes, ‘Berlin Express’, said Overstreet. During the war he flew in the D-Day Invasion. He “is said to have chased German fighters so close to the ground that he had grass in his wingtips and barbed wire hanging form his tail” (Freeman, The Final Roundup). In recent years he was awarded the highest French Award, French Legion of Honor for his bravery during his service in WWII. Bill Overstreet will be greatly missed, especially in the warbird community. The sacrifices that he made will forever be remembered, by those who knew him and even those who did not.